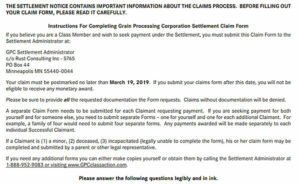 Muscatine residents must file a claim form today to be eligible for payment in the GPC settlement. Today is the deadline for former and current residents of Muscatine to submit claims for payment in a class action pollution case. 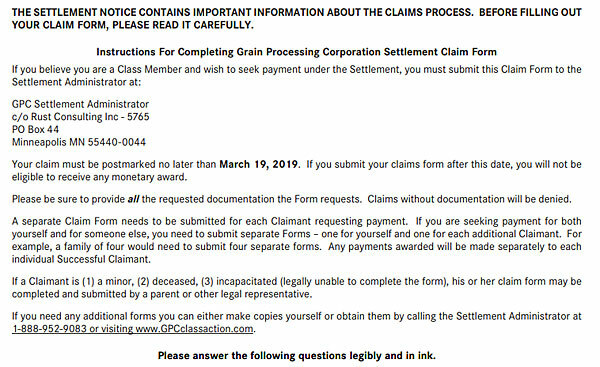 Corn processor GPC has agreed to a $50 million settlement for those affected by emissions from the company’s plant south of town. Lawyer Scott Entin says the legal team expects to receive around 3,000 claims. “We’re pretty confident that for folks who have lived in the class area for a long period of time, and also those people who are still living in Muscatine, we’ve gotten, you know, very good participation,” Entin says. Some potential beneficiaries only lived in the area for a matter of weeks or months. Those who saw the greatest effects could get as much as $16,000 each. Any leftover funds will go to community development projects with input from the company and residents.